intuVision has always been on the forefront of video content analysis technology with extensive R&D. We are dedicated to continuously advancing the intelligent video content extraction algorithms used in our products and custom solutions. Our strong R&D team prototypes and implements the most advanced algorithms into our products to provide the best technology to our customers. Visit this page each month to see newer R&D updates and results. At night, the headlights of a vehicle illuminate the scene and can be captured as a standalone object or as a large extension of the vehicle in traditional video analytics solutions. Even in situations where the object is not seen by the camera, the headlight beam of a passing car may trigger false alarms. intuVision VA provides an intelligent headlight glare removal option that can mitigate such issues. The images below demonstrate the new technique. As can be seen, the vehicle is correctly detected as a foreground object, while the pixels illuminated by the headlight are removed from the final processed image. 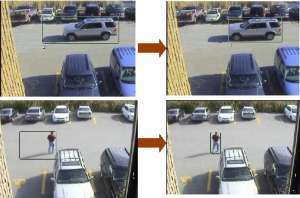 From left to right: 1) A vehicle, with the headlight turned on, enters the camera view. Note that only the vehicle is detected (a result of the glare removal technique). 2) The pixels illuminated by the headlight beam and the vehicle pixels get a high probability of belonging to the foreground. 3) The detected headlight beam pixels are filtered out. 4) The final processed image, devoid of any headlight beam false positives. The vehicle is correctly detected (indicated by the green bounding box). Traditional background subtraction methods make use of the RGB color space to model the scene background. This approach has an inherent limitation related to handling illumination changes, as the RGB channels are affected by illumination. As the scene gets brighter, the RGB values increase in unison, and vice versa. Thus, as clouds pass over a scene, the scene darkens and the RGB model detects a change, resulting in false positive detections. In addition to a RGB background model, we also support a model based on the CIEL*a*b* color space. This color space approximates the human visual system, with the a* and b* channels capturing color information based on the opponent color axis (like the human eye), while L* captures a lightness value, similar to human perception. As the illumination and color information is decorrelated, we detect changes in illumination and control the response of the background model. The image below demonstrates our effective handling of the illumination changes. The left image shows the response of the CIEL*a*b* model when there is bright sunlight, while the right shows the response when the scene darkens due to cloud cover. As can be seen, the background model correctly handles significant illumination changes and does not create false positive detections, specifically in the lower left corner of the image, where the greatest illumination change occurs. The intuVision personnel has several publications in the areas of computational video, video surveillance, biometric systems, integrated solutions and event understanding. The following is the articles list, if you want to read the whole paper, please contact us. IEEE, Applied Imagery Pattern Recognition, Washington, DC, October, 2012. "Learning a Background Model for Change Detection"
"GPU Enabled Smart Video Node"
"Who, What, When, Where, Why and How in Video Analysis: An Application Centric View "
"Border Security and Surveillance System with Smart Cameras and Motes in a Sensor Web "
"Automated person categorization for video surveillance using soft biometrics "
"Smart Sensing and Tracking with Video and Mote Sensor Collaboration "
"Inhibitory Surround and Grouping Effects in Human and Computational Multiple Object Tracking"
O. Yilmaz, S. Guler, H. Ogmen. "Stationary Objects in Multiple Object Tracking"
IEEE, Advanced Video and Signal Surveillance, London U.K., September, 2007. "Video Scene Assessment with an Unattended Sensor Network"
"Abandoned Object detection In Crowded Places"
PETS Workshop, CVPR Conf., New York City, NY., June 18-23, 2006. "Robust People Tracking with Metadata"
Proc. 32nd AIPR Conf. e IEEE, Washington D.C., Oct. 17-19, 2005. "Video Tracking with Biometrics Access Control"
Proc. Biometrics Consortium Conf., Washington D.C., Sept. 19-22, 2005. © Copyright 2006-2019 intuVision, Inc. All Rights Reserved. intuVision is registered in the U.S. Patent and Trademark Office.